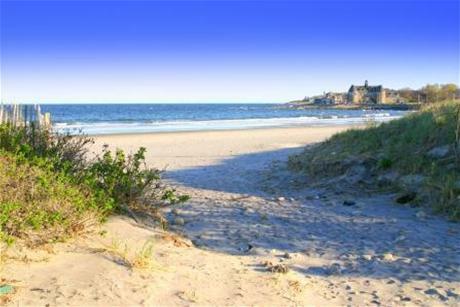 The Patriot Pole Vault Club & Mansfield Athletics are pleased to announce that the 2012 New England Beach Vault will be held on Narragansett Town Beach in Narragansett, Rhode Island on Saturday, September 29th. This USATF-Sanctioned Competition is open to all male and female competitors of ANY age, no matter if just getting out of elementary school or enjoying a retirement full of pole vaulting. Flight #1 is for athletes opening at heights lower than 11 feet. We can start as low as 4’. Warm-ups will begin at 8:30am with the competition beginning at 10:00am. Flight #2 is for athletes opening at 11 feet or higher. Warm-ups for this flight will begin at the conclusion of flight #1. The competition will begin approximately 1 hour after the beginning of warm-ups but will start no earlier than 1:00pm. USA Track and Field Membership is required to participate in this meet. Be sure to bring your proof of membership (either your membership card or printed out receipt from USATF) to the meet or you will not be allowed to participate. You may sign up for USATF membership at the meet if necessary. Mansfield Athletics will provide their “Ultimate Runway,” hand-built by coach Chris Mitchell. It is covered with a rubberized track surface, so spikes will be allowed. There is plenty of FREE parking at the beach in one of their parking lots right at the beach. New England Beach Vault t-shirts - Nike technical shirts - will be available the day of the meet for $30. Pre-order ahead of time when you register online for a discount. We will be bringing up an immense number of poles from the club for use by everyone. If you need to borrow a specific pole for the meet be sure to note the length and weight on your registration form. We can’t bring the entire shed to the meet, so be sure to let us know what you need! Our pole inventory can be found here. As with all outdoor meets, a lot depends on Mother Nature. We are working on having a possible rain-date, but we may have to cancel in the event of poor weather. If the event is cancelled, we will make the call the day before. An email will be sent to the address associated with pre-registered athletes. We will also post updates on our website, Facebook and Twitter Feed, which also appears on the bottom-right side of our club homepage. This event does take a lot of labor to put on and we desperately need your help! Stay tuned for more ways that you can be involved with this event or fill out this simple form to let us know that you are interested and how you can help out. Volunteering at this event can count as community service hours if needed for schools or other organizations. Pictures from historic New England Beach Vaults - held on York Beach in Maine - can be found in our photo gallery. Feel free to take a look and get idea of how much fun we have at this event! Oh Yeah! It's gonna be sick!